These 32 litre capacity Rexel recyclable shredder bags come in a 50 pack and are made from material which can be recycled along with their contents. 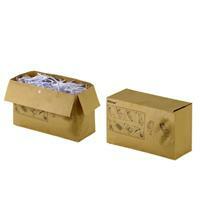 They are also self-seal making the whole recycling process cleaner and more efficient. They can be used with Rexel shredders with a 32 litre capacity bin, including the RSS2232 and RSX1632 shredders.